“What do we do in Danang on Christmas” is one of the most popular question on internet in recent time. 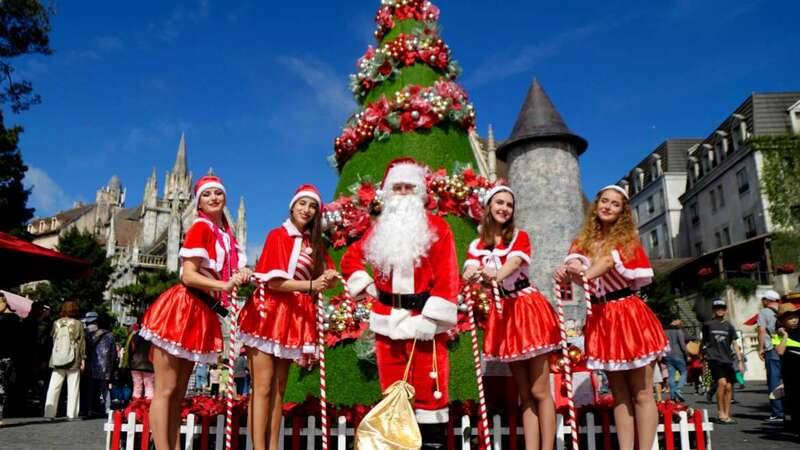 Here is the Best Places to Spend Christmas in Da Nang city. Recently, Churches are not only for Christians who come there for praying, but also many local citizens, especially young generation. On Christmas days, the Pink Cathedral is decorated with full of lights and colours. It looks sparkling with Xmas trees, Santa Claus and great music. There are also many interesting performances bringing peoplecloser. Where can we get around the Pink Cathedral in Christmas day? -Bach Dang st: this is the most beautifully decorated street in Da Nang.It attracts many people coming there to enjoy the fantastic view of Han river bridge and Dragon bridge. -Some Coffee shops on Bach Dang st and Tran Phu st: we easily find warm and great coffee shops around there also. Bana hills, no wonder, is one of the best place for Christmas days with “Winter Fesival” (from 1st Oct to 31 Dec). The French village with 18 cold degree makes us feel like in Europe. From the gate, visitors will be greeted by the decorative pine trees, the snowman, the space filled with snowflakes …We will be amazed at the giant pine tree taller than a tower decorated brightly. The towering red petal, green shimmering, makes the pictures of winter visitors more unique. As another cities in the world, shopping malls are always busy on Chrismas. Da Nang has some big suppertmarkets as Big C, Lottle, Vincom…All of them are decorated in red and white. The suppermarkets also have many Christmas promotionsthat you can choose some souvernirs for your family and friends. Jolie Da Nang Cooking Class would recommend Vincom center- it’s the best shopping mall that we could have great Christmas days in Da Nang. Why do we choose Vincom? Becauseof its shopping mallnot only, but also its atmosphere with colorful light and great music. Restaurants and skating rink are a wonderful combination. The Christmas atmosphere was bustling in the cold weather. To escape the cold winds and still have a warm noel, the most fun is to go into a cafe, sitting next to the view of the human life walking on the street, listening to the sweet Christmas songs. Then we enjoy a perfect taste of coffee. What a life! KokoGreen Kafe: 234 Phan Chau Trinh st, Hai Chau, Da Nang. If you love parties, why don’t you join Christmas party from a luxury hotel in Danang. Many hotels there prepared memorable night- for people that you can easily join with 35 USD-50 USD. The wonderful evening comes with a sumptuous buffet, festive funs, happy time with beloved ones in the intimate atmosphere, granting guests with enchanting and memorable memories. Let’s enjoy a glistening feast of Christmas Gala dinner by sharing a meaningful moment with your family with many exciting activities. Where to join Christmas eve in Hoi An? Kiman Hoi An Hotel $ Spaisthe best place for Christmas in Hoi an! If you want a memorable dinner in a local house, you should not miss out Jolie Da Nang Cooking Class. We will have great time with fun cooking and delicious food as a family on Christmas in Da nang. Jolie and her family always welcomesnew friendscoming to join.